Turbo the Tortoise is a side-scrolling platform game that was released towards the end of the Amstrad CPC's life. The game consists of six zones that take you through periods such as the Ice Age, Medieval Times and The Future. You work your way from left-to-right while jumping on enemies, leaping across platforms and avoiding the many obstacles in each level. The gameplay reminds me a lot of Yogi's Great Escape (1990, home computers) which was also published by Hi-Tec Software. Along the way you'll find items such as health, temporary invincibility and ammo. If you have the latter you can fire your weapon to take out bad guys from a distance. I'd recommend saving the majority of your ammo until the end of the level though as it makes the boss encounters much easier. Each boss has a pattern and once you know it they're complete pushovers. There's lots of interesting gameplay mechanics throughout the zones including Ice Age where you pick up blocks and throw them into the water to get across safely. 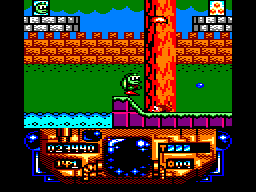 Later levels allow you to pick up a bubble and a jetpack - however, these only last for a few seconds and the level design doesn't really allow them to be used to their full potential. The enemies are fairly generic but there's a wide range of sprites and some that are only available in certain zones. The controls are responsive and it's easy to make quick second reactions when enemies suddenly enter the screen. The scrolling is very smooth for a CPC game which is quite a rarity! The graphics are superb with nice texture details, a wide range of colours on display and some large boss sprites. Unfortunately there's no music (probably due to space restrictions) which can leave the action lacking a bit of atmosphere. Turbo the Tortoise is an excellent platform game that deserved more attention from the gaming public. It's no rival to Super Mario Bros. (as Amstrad tried to convince us!) but it's a well crafted title that has just enough variety to put it towards the top of the genre on the CPC. Random trivia: I'm not sure if it's intentional or not but the Prehistoric Zone boss looks like Raphael from Teenage Mutant Ninja Turtles, and the Future Zone boss is a spitting image of Kid Chameleon from the Sega Mega Drive game!